As the rouble collapses, residents of Tomsk have long memories — from Black Tuesday 1994 to Black Tuesday 2014. Tomsk is a provincial city in the best sense of the word. Indeed, as the largest centre for education and science on the other side of the Urals, it is often called the most European city in Siberia. As for living standards and income, Tomsk is usually found mid-table in the list of Russian cities with populations over 500,000. If you want to take Russia’s ‘temperature,' Tomsk is a good place to do it. So how do Siberians see the current economic crisis, its causes, and how do they plan to react? The rouble crashed for the first time in Russian history on 11 October 1994, better known as ‘Black Tuesday.’ In the course of a single day, the national currency lost 27% of its value against the dollar. This fall did not last long, however, and the rouble regained its former value within three days. This sudden plunge smacked of panic more than anything else, and its consequences were ultimately limited. In the provinces, these events had little impact, and hardly anybody remembers this period nowadays. The far more serious crisis of 1998 wiped the first Black Tuesday from Russian memory. ‘Back then, people just didn’t understand what to do with money in principle. We didn’t know how to live under capitalism, and we had high hopes for the reforms. At the start, it seemed that we were home free — democracy had arrived, and soon enough we’d be living just like Europe. But it didn’t turn out that way,’ says pensioner Vladimir Fedorov, who worked as a foreman at Tomsk’s Sibkabel factory during the 1990s. But many people remember the August 1998 crisis. In that month the exchange rate was roughly six roubles to the dollar. By 1 January 1999, one dollar cost 21 roubles. Russia’s ever-changing government (four different prime ministers in one year) had been conducting an extremely shortsighted and inept economic policy, trying to plug holes in a deficit-ridden budget with the help of loose credit and high-yielding state bonds. This led to the first default on domestic public debt in world history: many Russian banks closed, and many people lost their savings yet again. The difficult economic situation was compounded by complete political chaos. Controlled by a communist majority, the State Duma openly opposed the Russian President Boris Yeltsin, and was preparing to impeach him for waging an illegal war in Chechnya. The constant reshuffle of prime ministers did not contribute either to solving the country’s economic problems. Nevertheless, the situation turned out to be rather profitable for those Tomsk residents who managed to retrieve their savings from the banks in time. ‘We didn’t have any foreign currency. I was working in a research institute, and my husband was teaching at the university. Our wages were very low. We only had enough to provide for ourselves and our kids. We had no money to save,’ remembers Valentina Sukhareva, who is now retired. But in 1998, Valentina was working as a senior researcher. ‘My son had just finished studying oil and gas production at university, and had started working shifts at oil rigs in Tyumen region. The oil business paid very well for that time. You just couldn’t find that type of money in Tomsk back then. We changed half of his wages into dollars and put it in the bank. After four years, we had something like $30,000. All the same, Russia in 2014 is quite a different country than Russia in 1998. The 1998 crisis was preceded by years of radical economic, political and social change that followed the collapse of the Soviet Union. While economic crises had a particularly sharp impact during the 1990s on the whole of the population because the majority of Russians were just as poor as one another, during the 2000s, the Russian economy managed not only to stabilise itself, but also put on some weight. In this climate, a new middle class began to form, with a new way of life and new values. And although debate continues on how to define the middle class in Russia, 47% of people living in cities consider themselves members of this new class. Now a generation of people have grown up in Russia, which are accustomed to a different standard of living. The Russian middle class can now afford at least one trip abroad per year, and a car, as well as other purchases, which go well beyond the basics. Most people living in cities have a stable income, property and savings. Unlike 16 years ago, in 2014, it’s not survival that’s at stake. 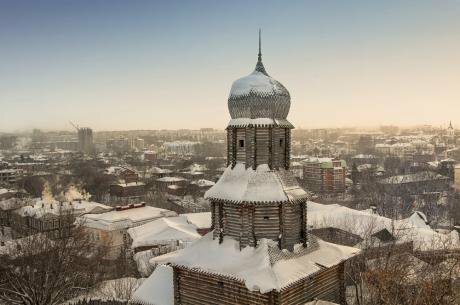 The old Siberian city of Tomsk is famous for its wooden architecture. (c) Shutterstock/Madruaga Verde. Unlike 16 years ago, in 2014, it’s not survival that’s at stake. To put it in numbers, in 1998 the average monthly wage for Tomsk was 760 roubles (£72 before the default, £32 after August). Now the average monthly wage for Tomsk region is 29,000 roubles (£280 as of 17/12/2014), which is slightly less than the average for Russia as a whole. Even taking inflation into account, over the years, the difference in incomes is tangible. Another important difference between these crises is that the 1998 collapse was accompanied by outright government ineptitude. While Yeltsin had become a figure of pity, today, the approval ratings of Putin remain consistently high. According to a Levada Centre survey in late November, 58% of respondents would like to see Putin as president beyond 2018. For the moment, apparently, even the falling rouble cannot shake that approval. But with the rouble in freefall, nobody is prepared to forecast what will happen next. On the whole, however, Tomsk residents remain calm. ‘I think it’s too early to talk about the consequences of the crisis just yet. We’re only at the beginning of it,’ says entrepreneur Alexei Kolosov, who owns a chain of homeware shops in Tomsk. Kolosov started his own business almost 20 years ago and has been through all the usual problems of small and medium businesses in Russia. ‘Only one thing is clear: whoever knew that this situation was coming beforehand had time to get their bearings, change their money into foreign currency and other assets. Those who didn’t have time… Well, they were too late. Independent experts, however, give distinctly less rosy projections. Business consultant Nadezhda Dreval, for example, who consults different companies in Tomsk on marketing, advertising, business strategy and human resources: ‘Suppliers have raised their prices, and so businesses aren’t expecting a crisis, but have rather already encountered it. Not everyone has money to invest, and for many, whatever money they had is already invested. Exchanging roubles for dollars makes little sense in this situation. Right now they’re putting money into products. Hundreds of companies are likely to go under in these conditions. Hundreds of companies are likely to go under in these conditions. Nobody is going to raise wages — ‘Be glad you have a job at all’ is the philosophy. Delays in salary and wages are also unavoidable given the delays in payment between businesses. And, as prices rise, there will also be unexpected and short-term falls in prices due to barter payments: companies will sell off goods cheaply to claw back their money more quickly. 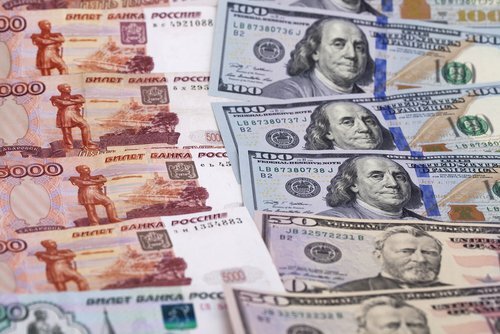 Even if a miracle does happen and the exchange rate returns, let us say, to 40-45 roubles to the dollar by next spring, business will not lower its prices significantly, but will try to build a foreign currency ‘cushion’ and adopt a wait-and-see attitude. Many Russians agree that the economic crisis is connected to events in Ukraine. But when it comes to the question of responsibility for the current situation, opinions differ. Some sections of society believe that Russia’s intervention in Ukraine’s internal conflict was the right decision. They support the President’s position and the government’s current domestic policy. After the annexation of Crimea in March, there has been an unprecedented explosion of patriotism in Russia; and feelings of pride in one’s country trump any sense of anxiety over the future. One can sum up the opinion of the overwhelming majority of people as follows: ‘Russia should defend its interests at all costs. It needs to show that it’s strong, independent and that we are a great power.’ Supporters of this point of view accuse the West of aggression against Russia; and they believe the rouble’s fall is the result of intentional manipulation by outside forces. Other people believe that Russia has enough of its own problems, and that the government’s current policy hits the Russian people hardest. Before intervening in the affairs of another state, Russia’s leadership should have thought long and hard about the results of this kind of intervention. However, the percentage of people dissatisfied with the actions of the Russian authorities is considerably less than those in favour; and their opinion is lost amidst the atmosphere of patriotic euphoria. Critically minded citizens are, on the whole, drawn from the intelligentsia and young, educated city-dwellers from the middle class. Given that Tomsk is Siberia’s education hub, the percentage of liberally minded residents has always been higher on average than the rest of the country. But all the same, there are still considerable numbers of ‘patriots’ here in Tomsk. The current situation could best be called a state of anxious expectation. Many people in Tomsk – in many parts of Russia – are yet to feel the impact of the economic crisis; and the rising exchange rate remains, for the meantime, a more or less abstract figure. People who have large amounts of savings usually follow the forecasts closely. Indeed, there were people already converting their savings into foreign currency back in the spring, just as the global outlook took a turn for the worse. Those with smaller amounts of savings will likely keep what little they have in roubles. While there are stockpiles of goods already paid for, vendors won’t risk raising prices too high in the run up to New Year. Moreover, the pre-holiday consumer boom is just about to hit. In Tomsk, price rises on basic goods are also keeping within the limits of inflation norms. However, the price of gadgets and computer equipment has already shot up. Before, when people had no experience of consumerism, the list of things necessary to survive consisted simply of ‘soap, salt and matches’ (as the Russian saying goes); today, the list of ‘necessary’ purchases looks different. Consumers are looking to buy imported goods — footwear, clothes, computers, plumbing and electrical goods, even cars, and all of these may become significantly more expensive. Nevertheless, years of relative prosperity have inspired some confidence: basic goods may well become more expensive, but they will still be found on the shelves.